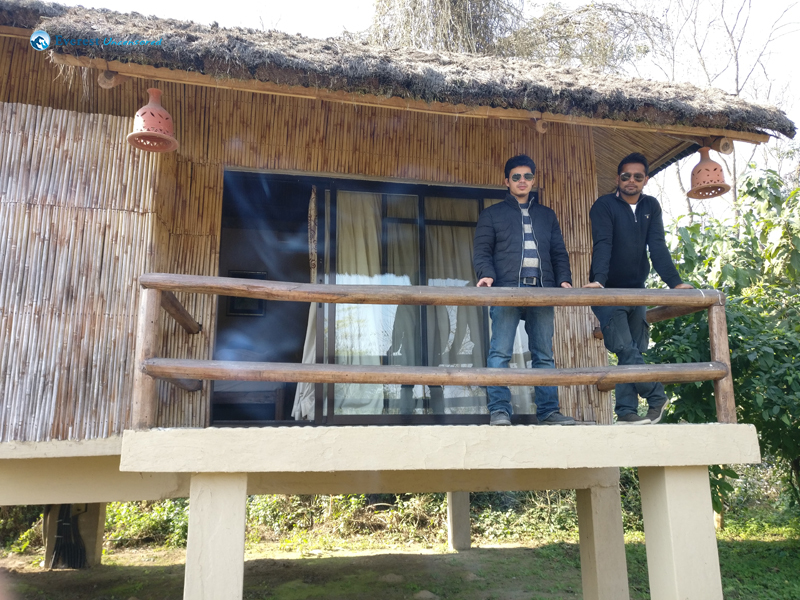 Calls were made, rooms were booked. 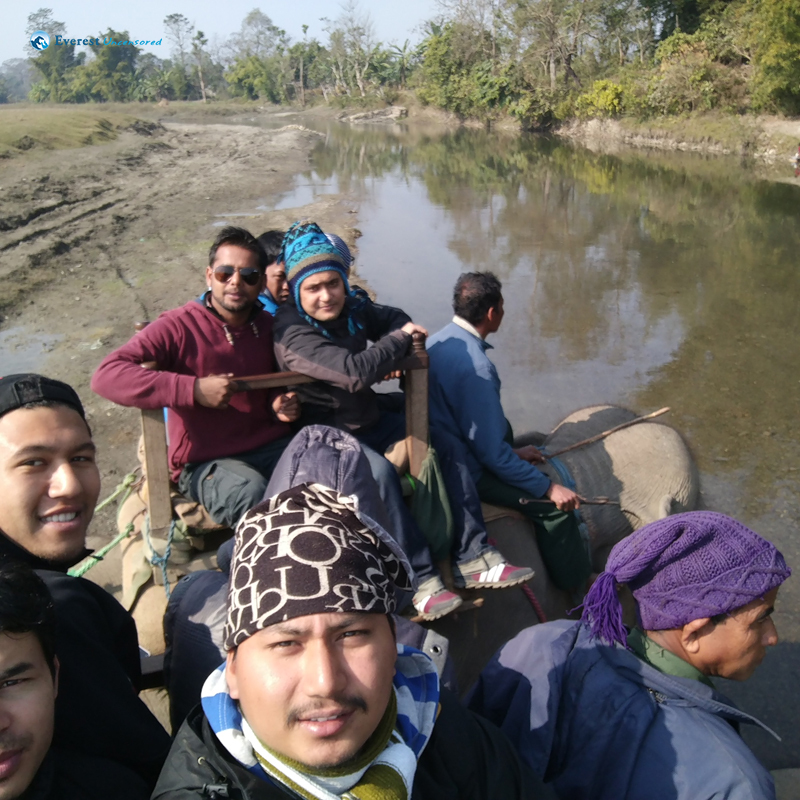 All necessary arrangements were in place as we collected all the members before first light and sped past Kalanki at 6:15 am. 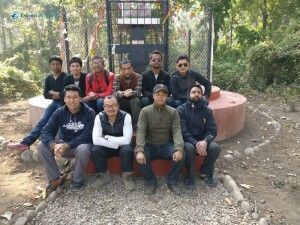 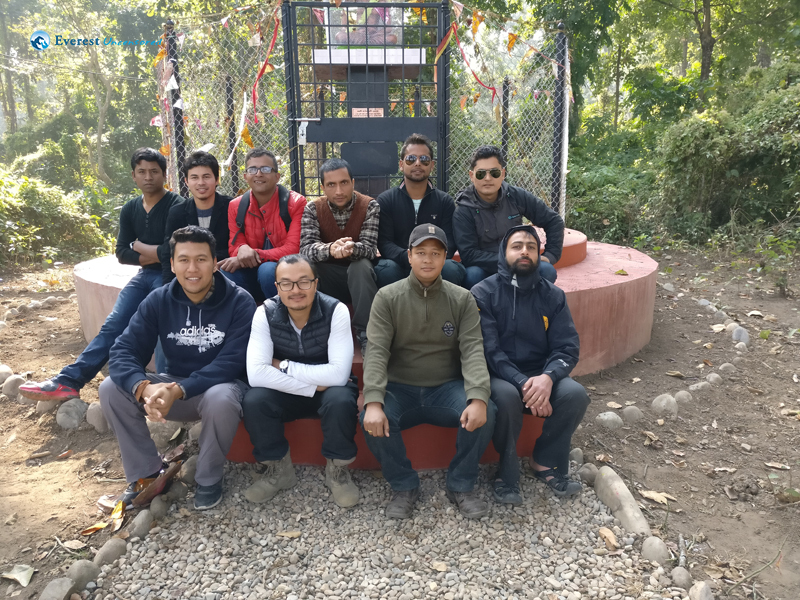 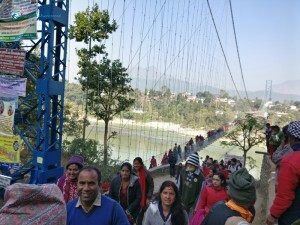 We were only quarter of an hour late in our bid to cross Kalanki in order to pass the four-hour long blockade at Mugling which started at 11 AM. 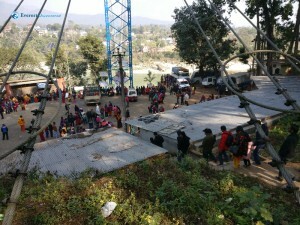 Festivities of Maghe Sankranti (first day of the holy month of Magh) were in the air and everyone appeared in high spirits as we waited for our morning snacks at Naubise. 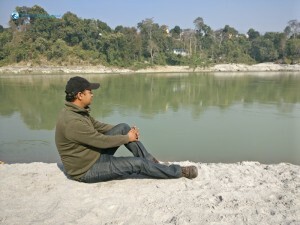 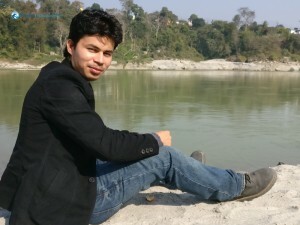 In no time we were following the Trishuli river that appeared a murkier shade of aquamarine at peak of the winter season. 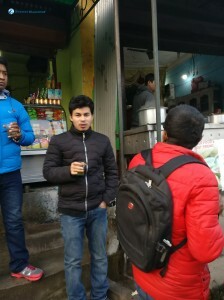 Mugling appeared colorful with rows upon rows of stalls laden with freshly picked oranges. 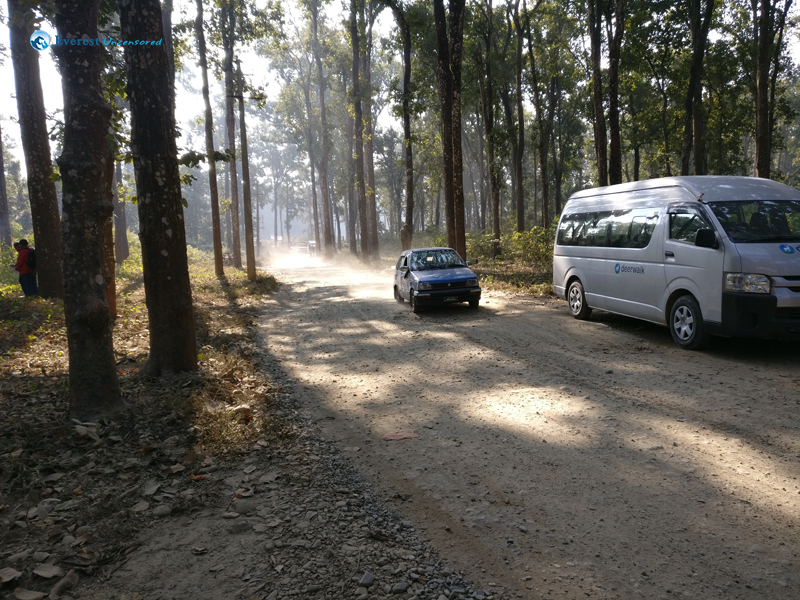 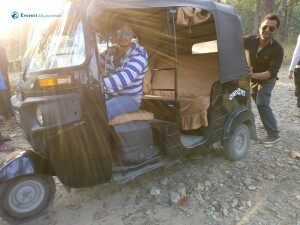 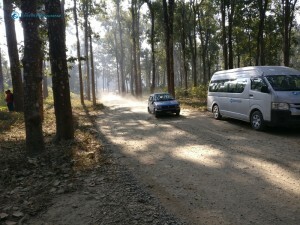 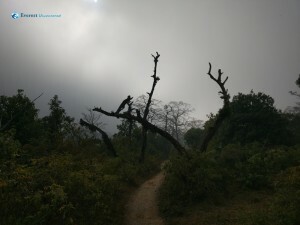 We took a right and entered a dusty off-road track that led to Devghat through dense jungle. 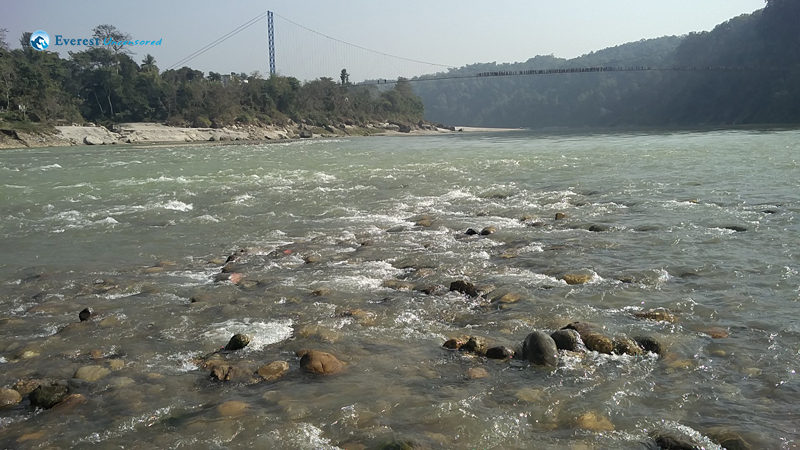 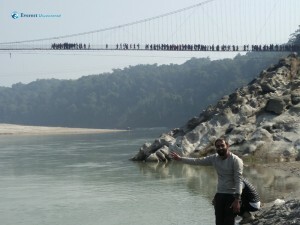 Devghat, situated at the confluence of Trishuli and Kali Gandaki rivers is considered one of the holiest sites in Nepal. 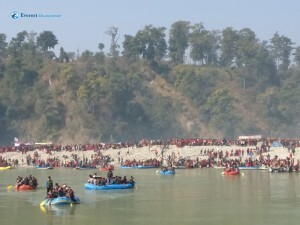 We had heard that a huge mela takes place there on this day. 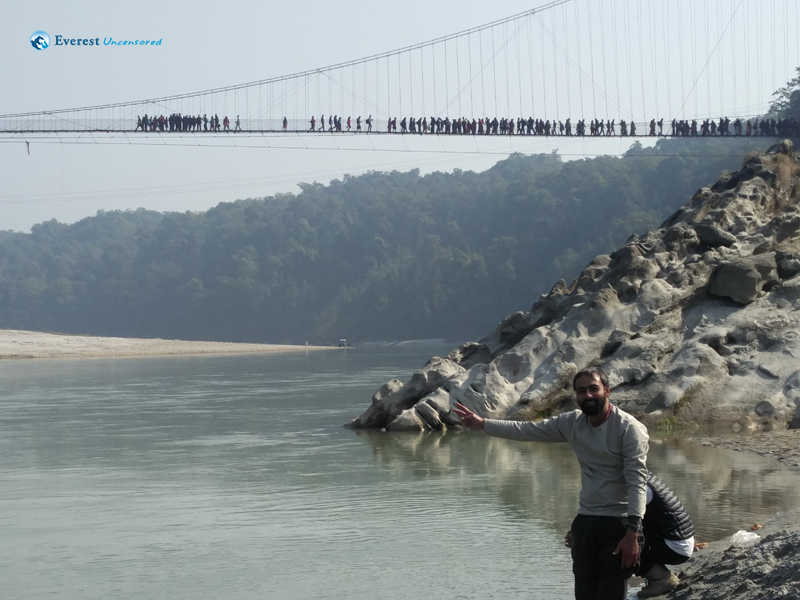 We walked for a while until we reached the river and the place was bustling with throngs lining up to cross the suspension bridge to the temple on the other side. 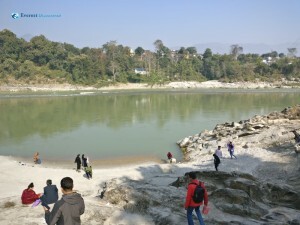 We saw many people taking a holy dip in the river as this act is said to cleanse oneself of lifetimes of misdeeds. 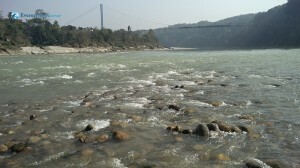 Lava also took a holy dip in the river and appeared fresh as we returned. 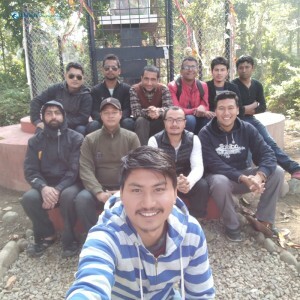 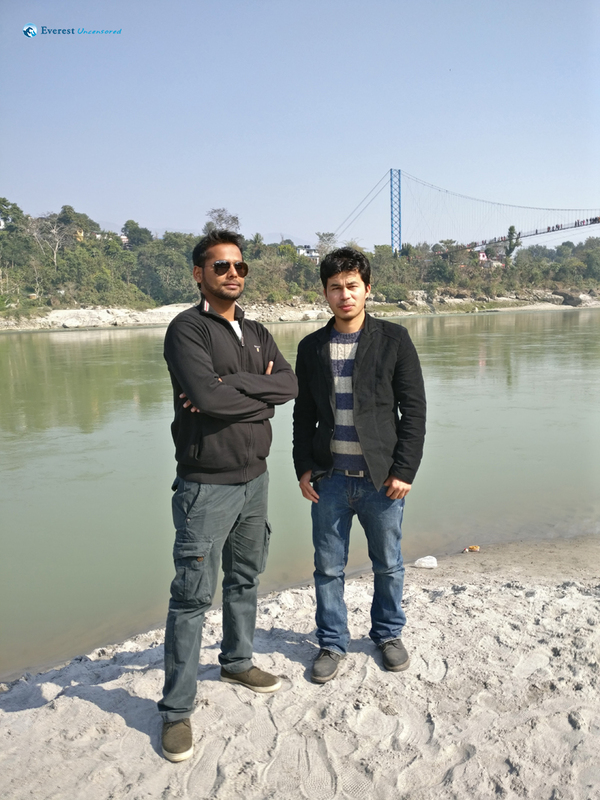 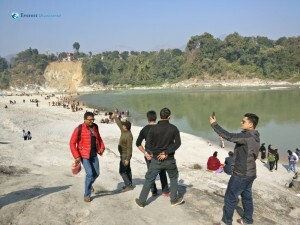 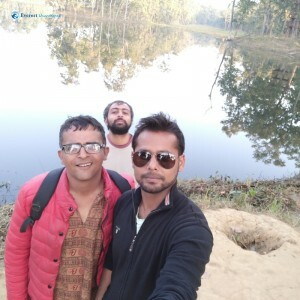 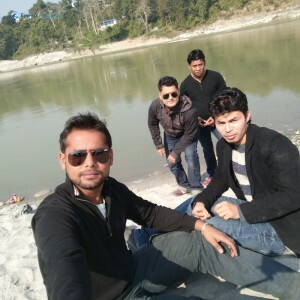 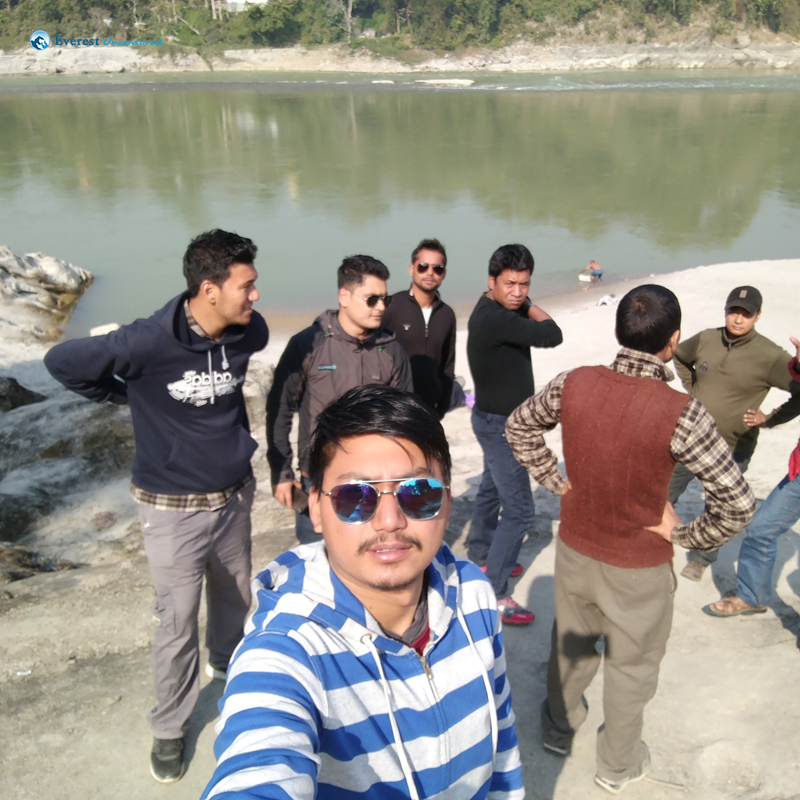 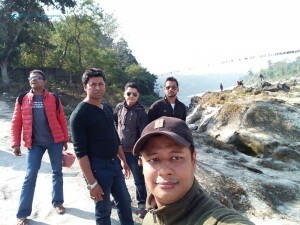 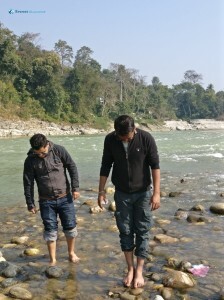 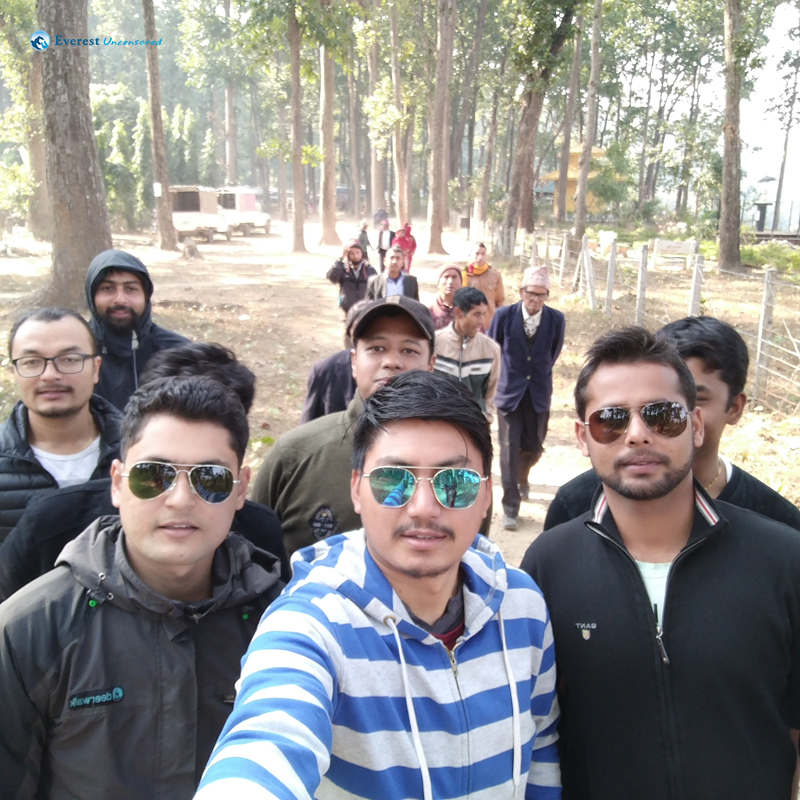 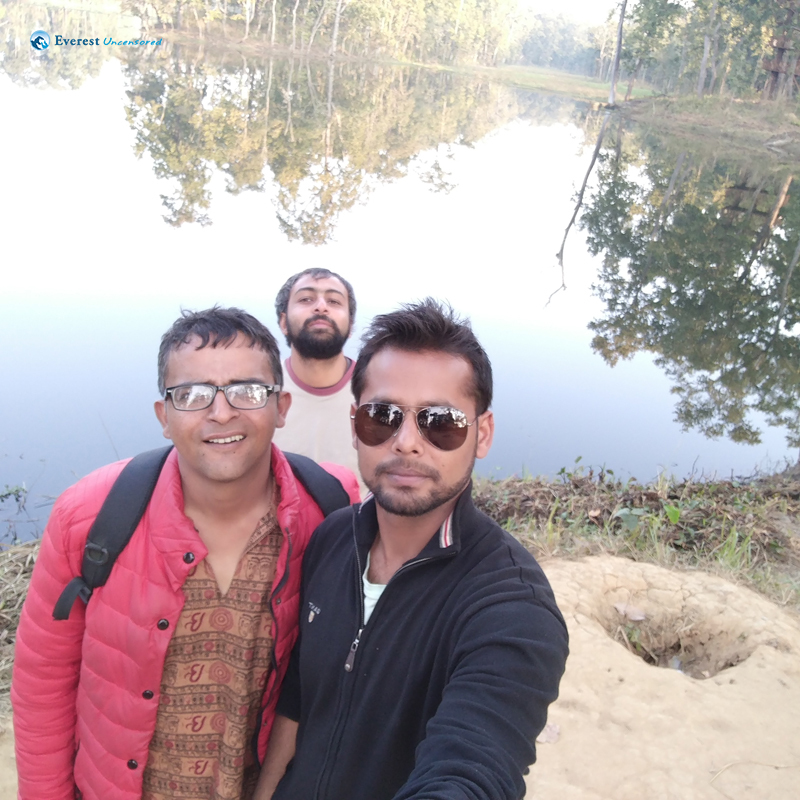 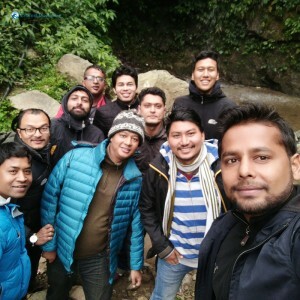 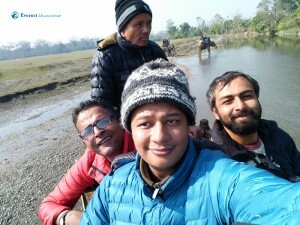 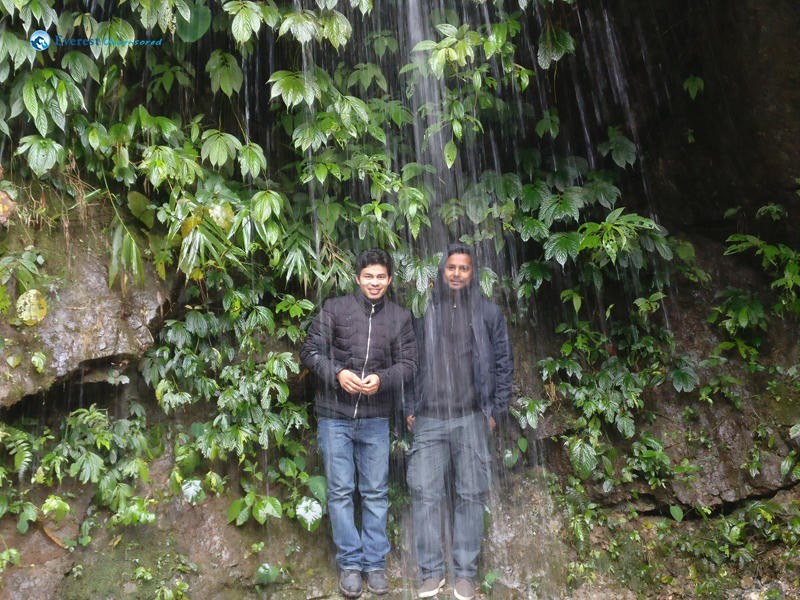 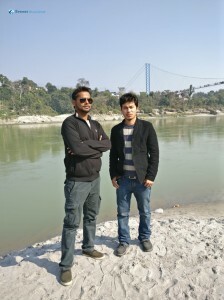 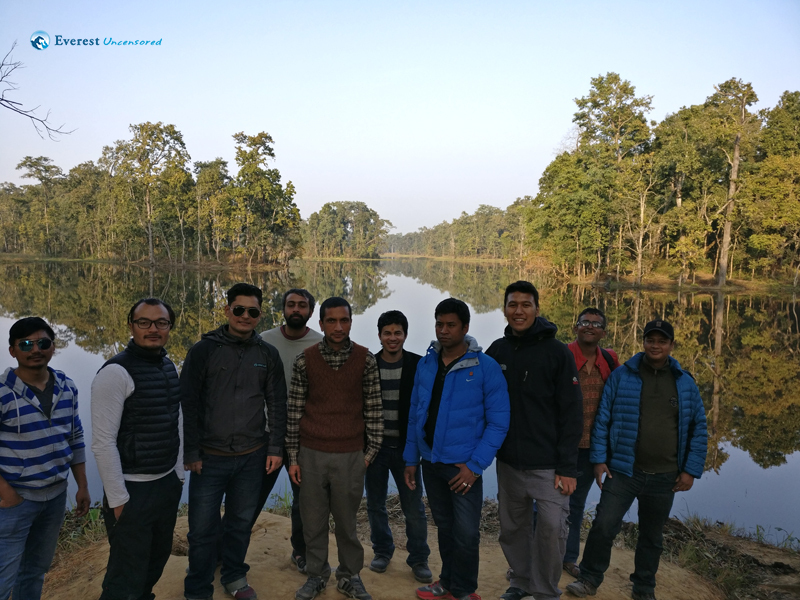 After lunch by the bridge over Narayani river, we still had a lot of time before reaching our destination so we decided to make an unplanned trip to Beeshazari Lake(Tal). 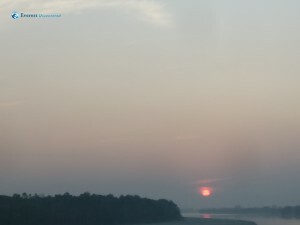 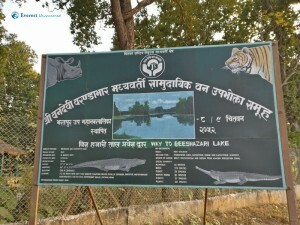 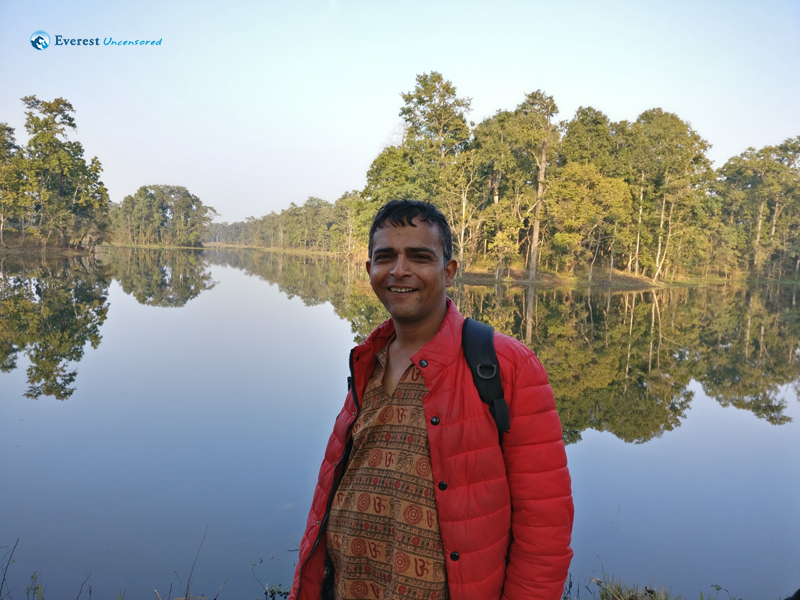 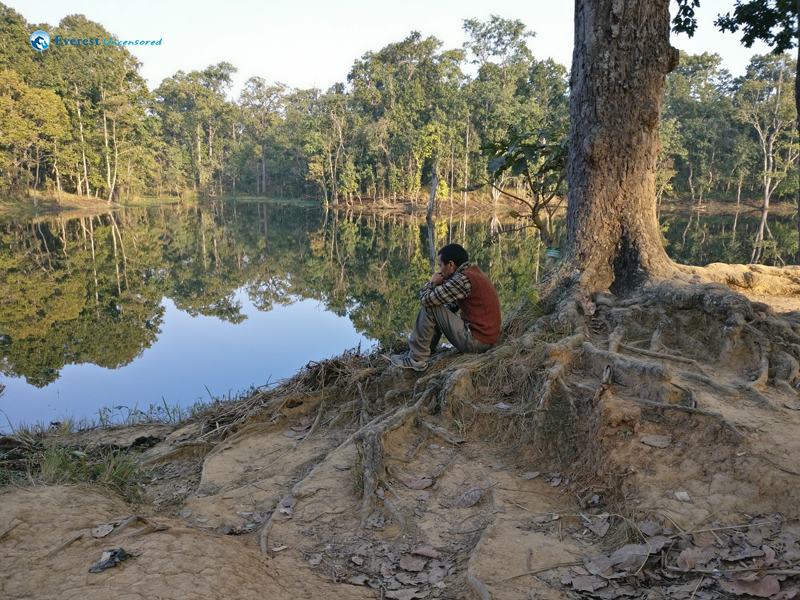 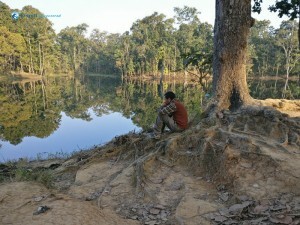 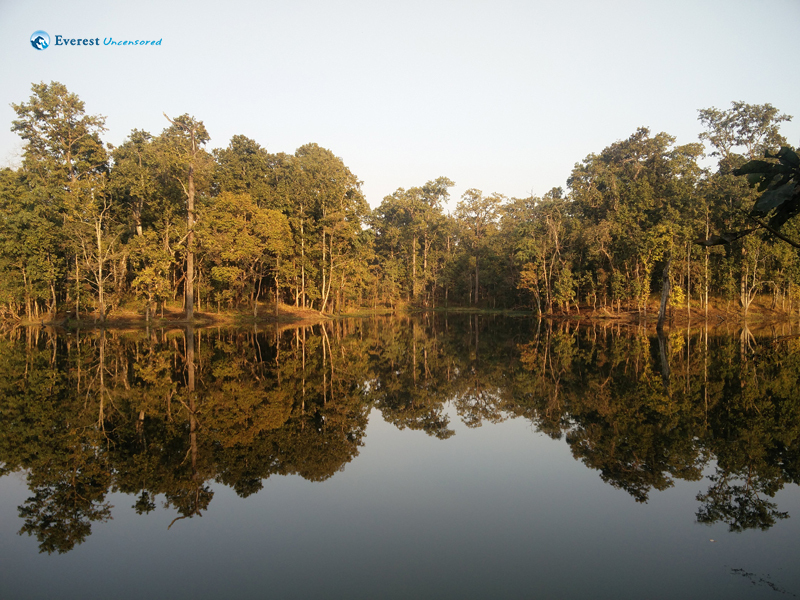 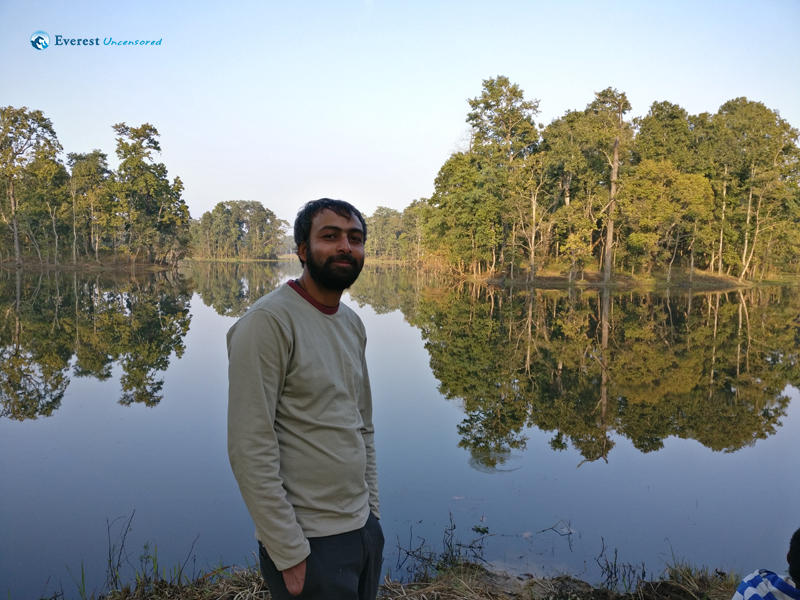 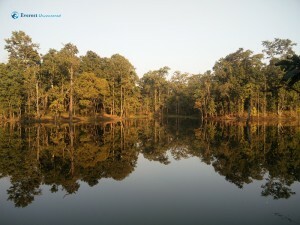 This lake lay inside the buffer zone of protected Chitwan National Park and is an important Ramsar site (wetland) for several wildlife animal and birds. 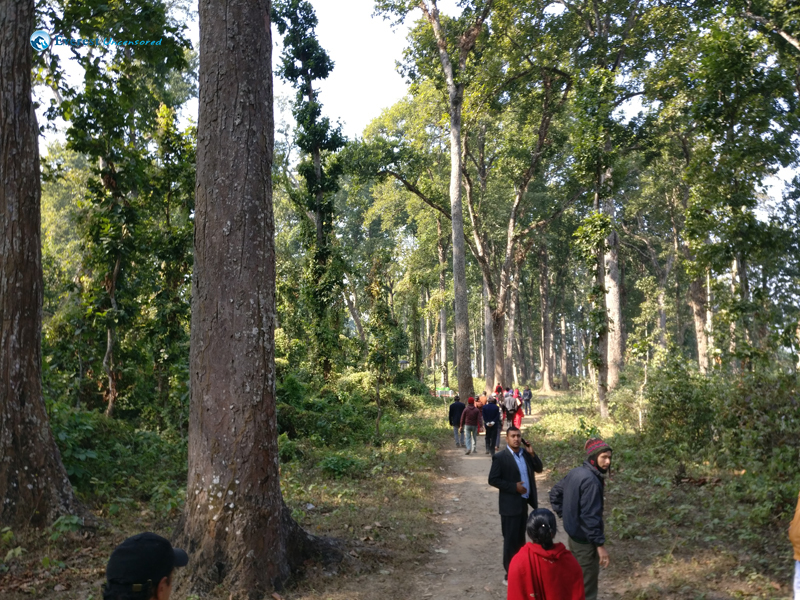 We walked through dense forest and undergrowth before reaching the lake. 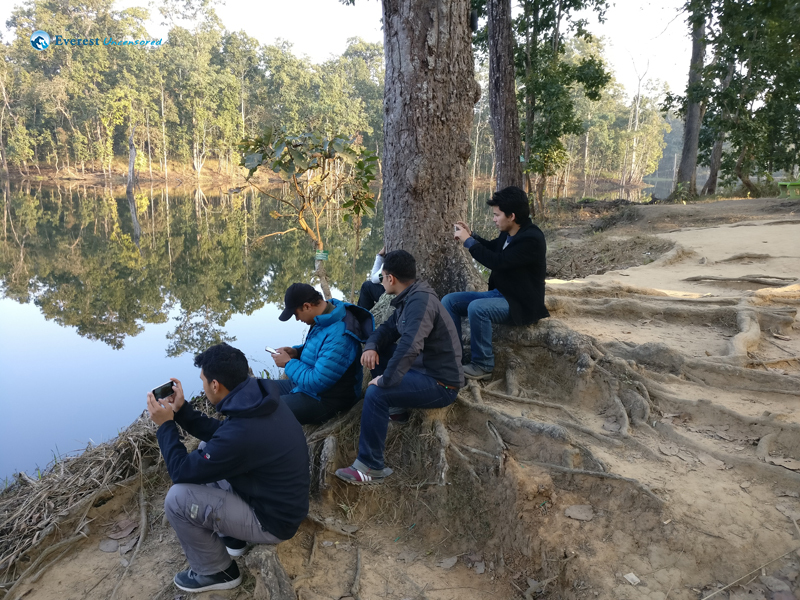 Around the lake, we were able to spot many species of colorful birds including herons and storks. 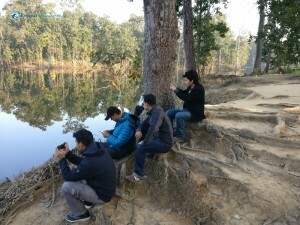 We spent about five minutes in silence by the lake to be one with nature and let the peace sink in before heading back. 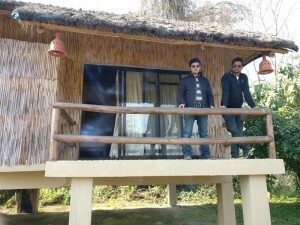 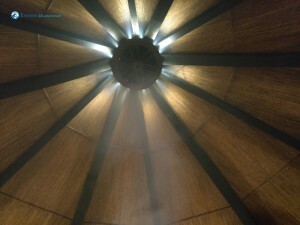 By the time we reached our destination – Temple Tiger Green Jungle Resort, it was already dark. 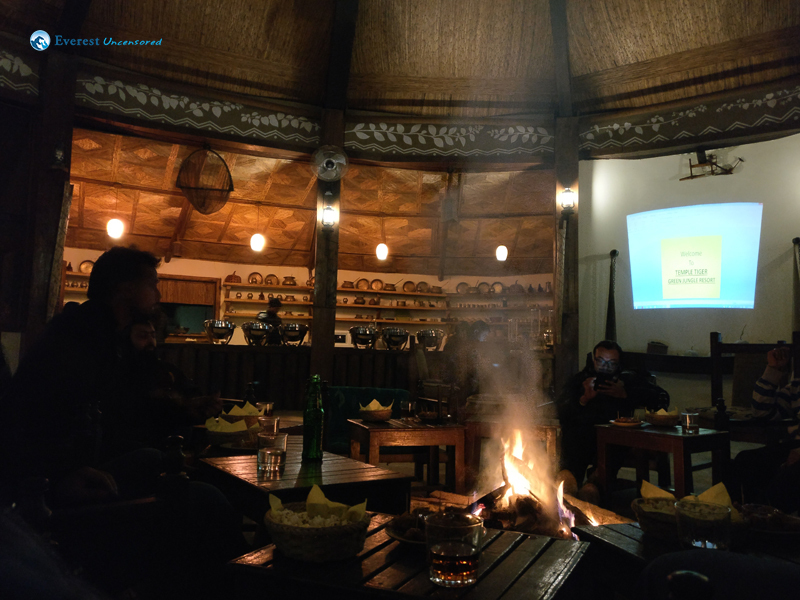 We were welcomed by the staff there and freshened up before sitting around an indoor campfire. 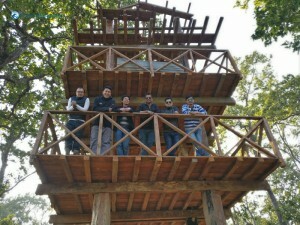 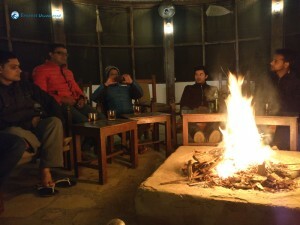 At the campfire, the staff gave an informative account on Chitwan National Park. 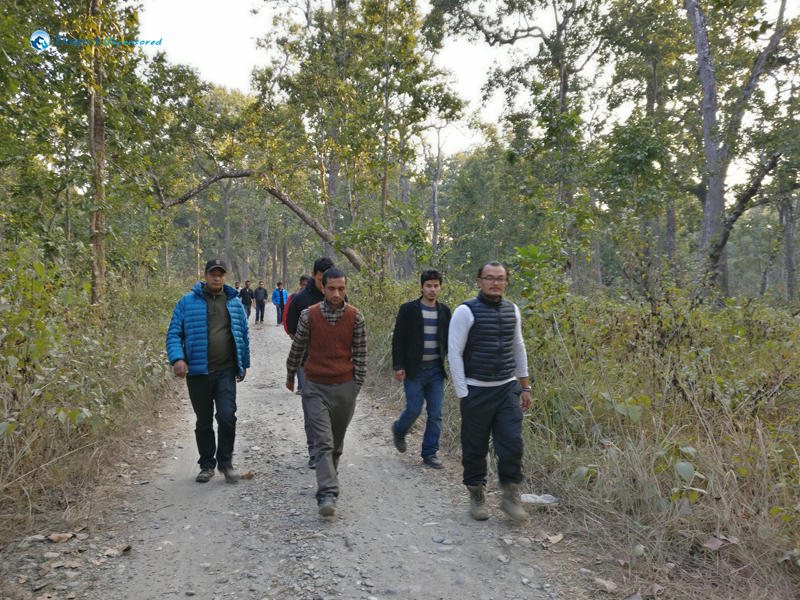 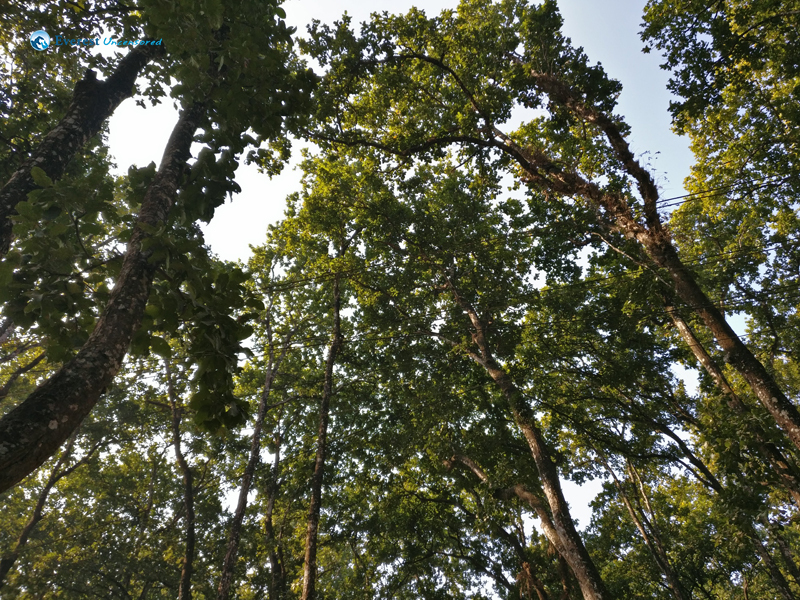 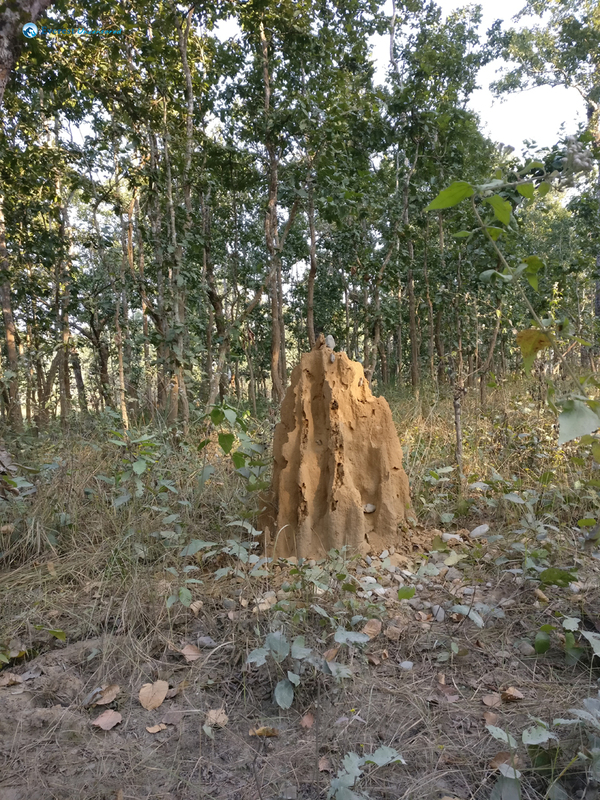 I was amazed to know the rich diversity of flora, fauna and insects found inside the park including hundreds of species of birds, sloth bear, leopards, riverine forests, grasslands, crocodiles etc. 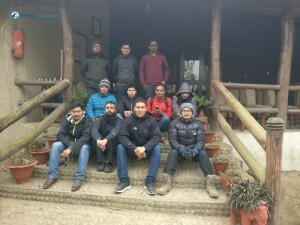 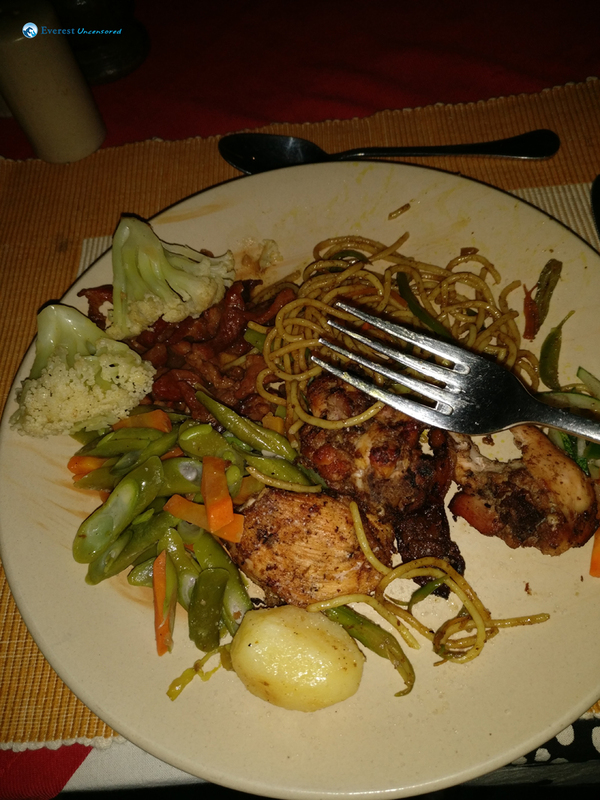 At night, a thick blanket of fog descended and the temperature plummeted as we were served an amazing continental dinner. Soon the fire crackled out and everyone except a few retired to their respective rooms in anticipation of elephant safari next day. 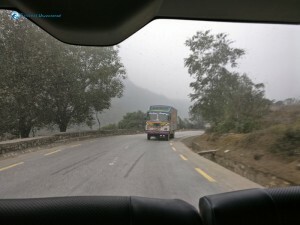 Next day, we had to postpone our elephant safari by an hour as the fog still lingered. 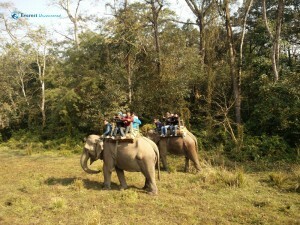 After breakfast, we filed up to the large platform that would help us get on the gentle majestic creatures. There were altogether 3 elephants that I later learned were called Champakali (about 60 years old), Kantikali (about 50 years old) and Durgikali (about 17 years old). 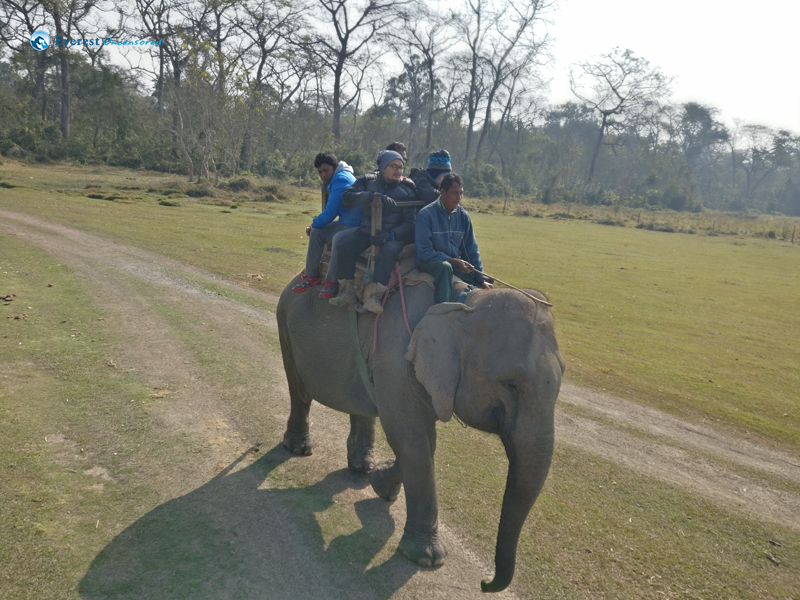 There were altogether 3 elephants that I later learned were called Champakali (about 60 years old), Kantikali (about 50 years old) and Durgikali (about 17 years old). 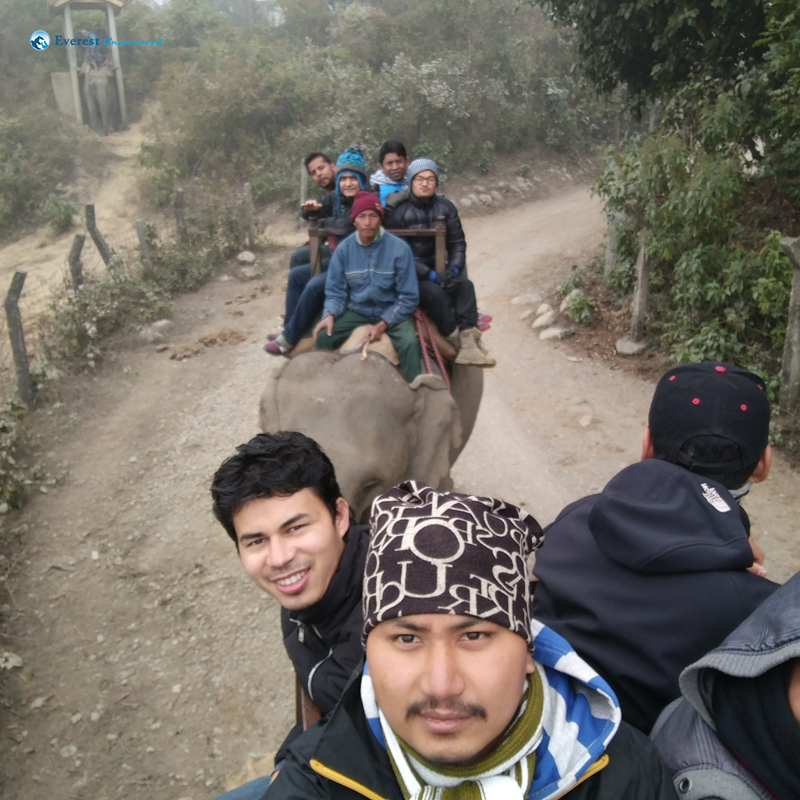 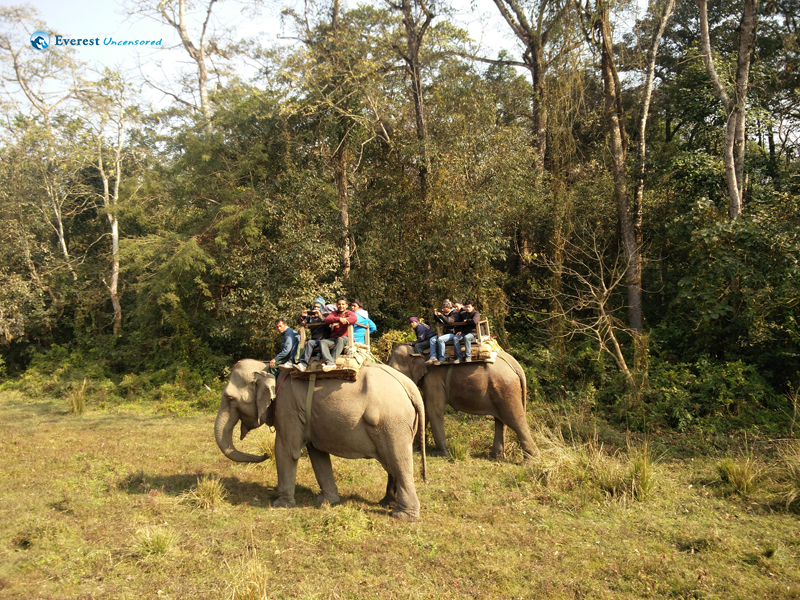 The elephant ride was one of the most memorable activities that I ever did as one of the resort’s staff came along with us and I got to ask him all sorts of questions from my bottomless well of insatiable curiosity. 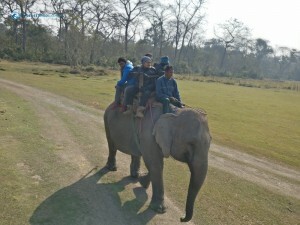 He informed us that Durgikali was a cross between the wild elephant and local elephant. 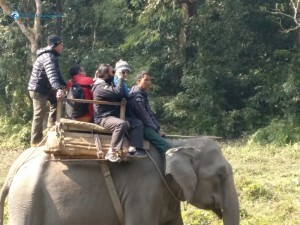 I didn’t expect to see a lot of creatures during the safari but we got to see a lot of birds including the peacock and rhesus monkeys. 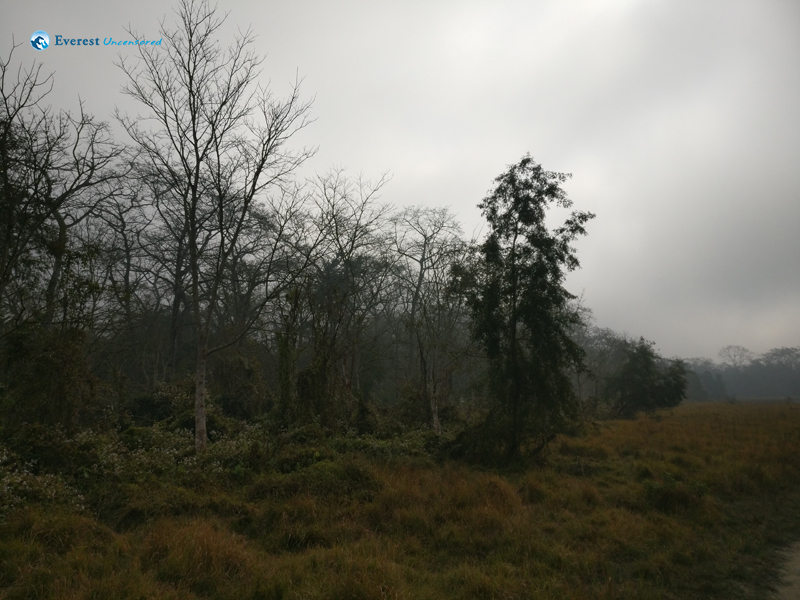 We saw an umbrella amongst the trees and the resort guide told us that it was a ritual of the ‘Bote’ or boatmen clan, to bury their dead in the forest and place an umbrella and sometimes mosquito nets on top of the site. Soon we came upon a rhino calf that had come out from the foliage to bask in the sunshine in the river bank. 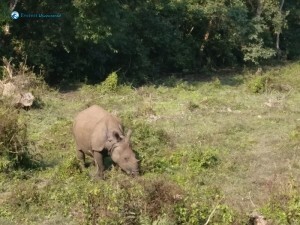 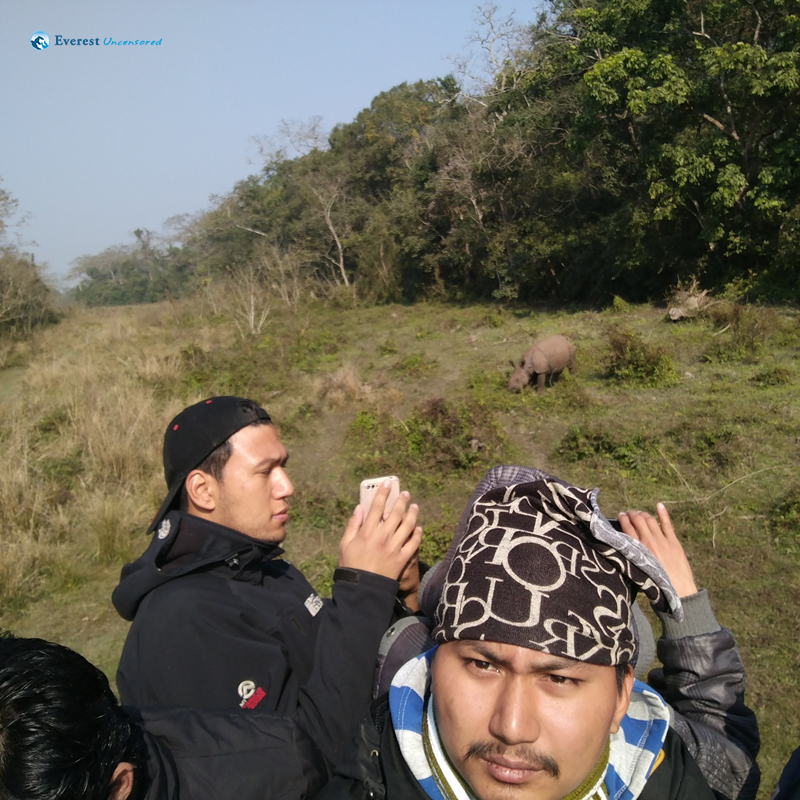 We stopped for a while to look at the rhino calf in its natural habitat and then returned through a local village. 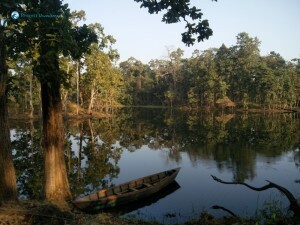 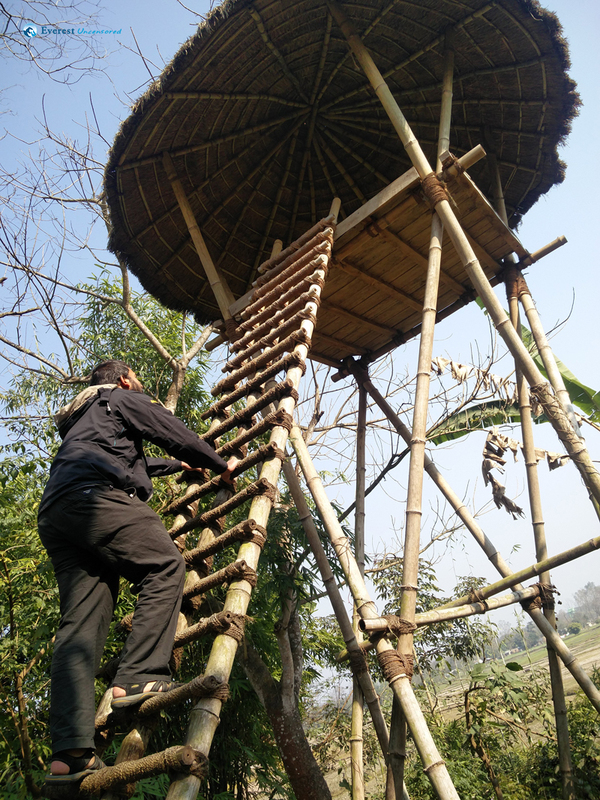 The area was predominantly a Tharu settlement which had been relocated from inside the park when it was established. 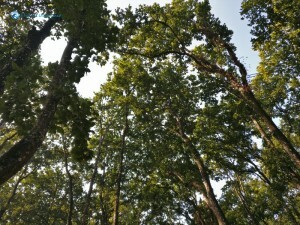 It was great to experience the symbiotic relationship the Tharus had with nature surrounding them. 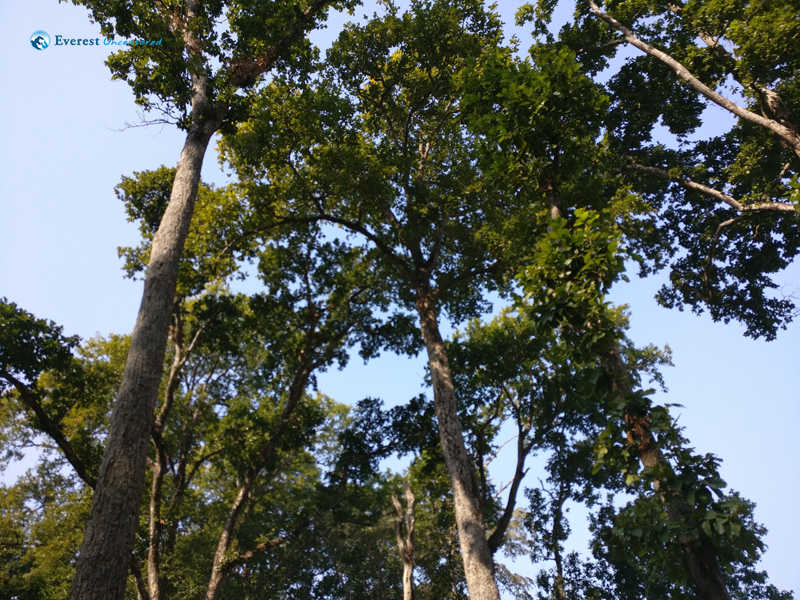 The forests of the buffer zone was a community forest that belonged to the locals. 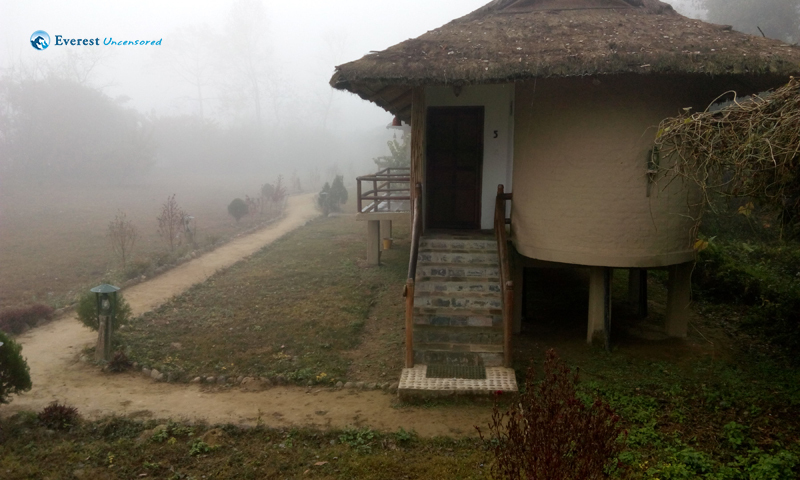 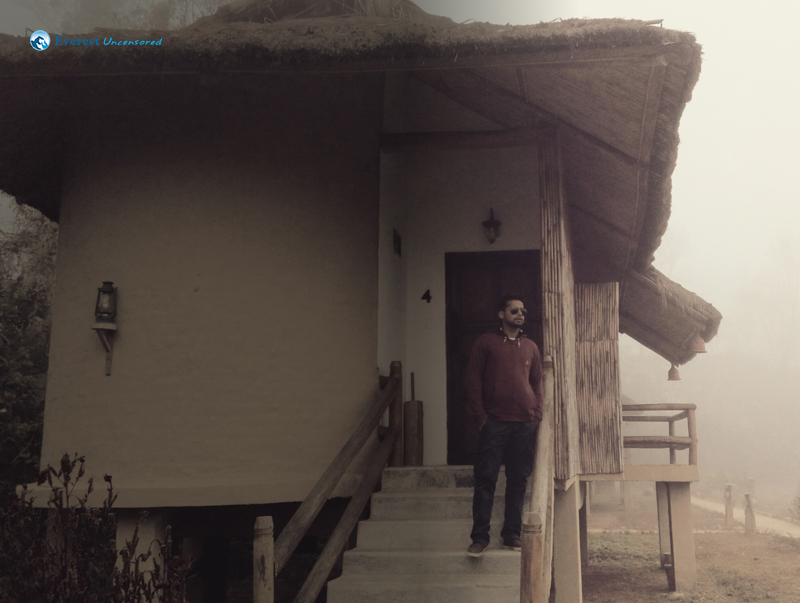 There was even a homestay village where each home had a few rooms that could accommodate guests. 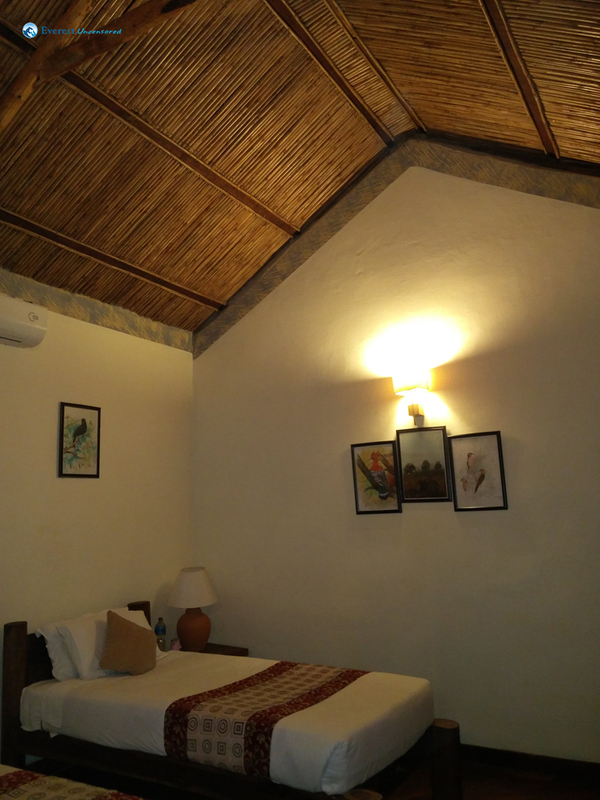 It appeared that the resorts also supported these indigenous communities directly and indirectly and everyone appeared to belong and live in harmony. 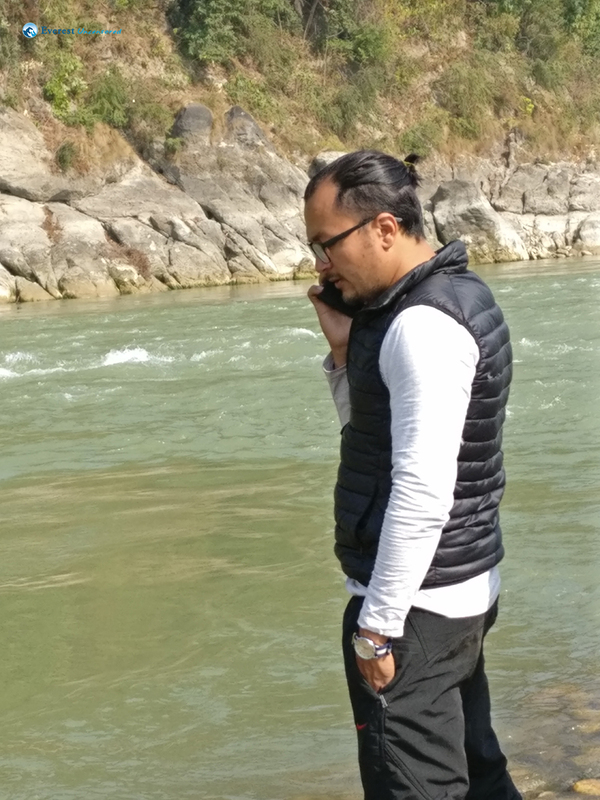 I found that the combined effort of the government, locals and private firms there could be an exemplary model for all Nepal on how to properly allocate and utilize natural resources. After lunch, it was time to depart and we bustled into the van promising to return soon. 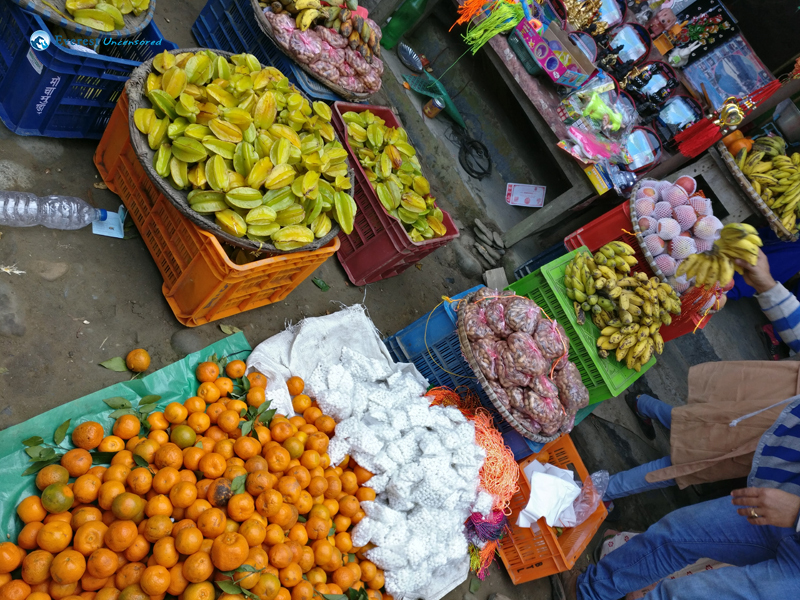 At Mugling, we got hold of some fresh seasonal tangerines. It was a fitting end to a memorable trip.